New year and brand new CVC exclusive kit. High power LED headlight kits have now been born. After a whole year of research, development and testing the CampervanCulture.com LED headlight kits are now available to buy. Research – This one has been an interesting one for sure. 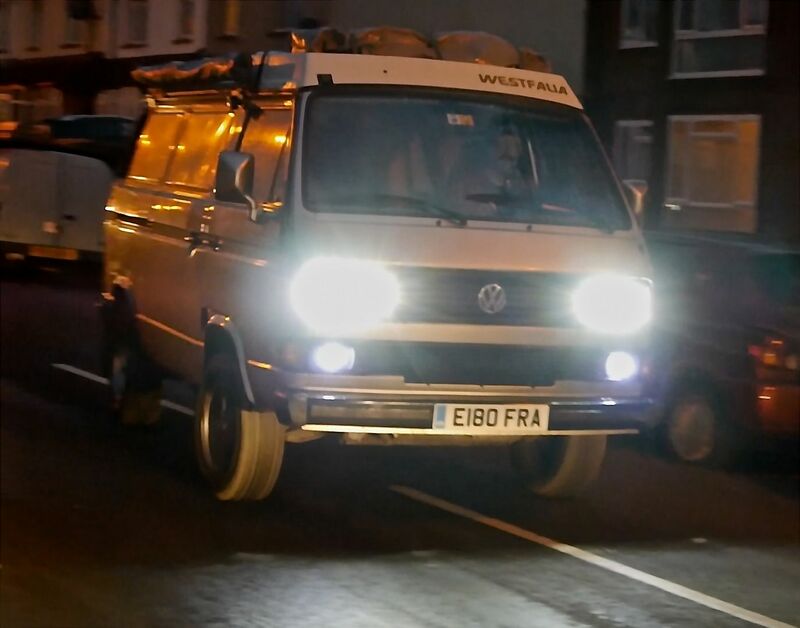 After finding the headlights on the CVC Westy from factory are just dam dangerous and trying out the various relay upgrades and related bulbs just not quite good enough for our personal requirements. 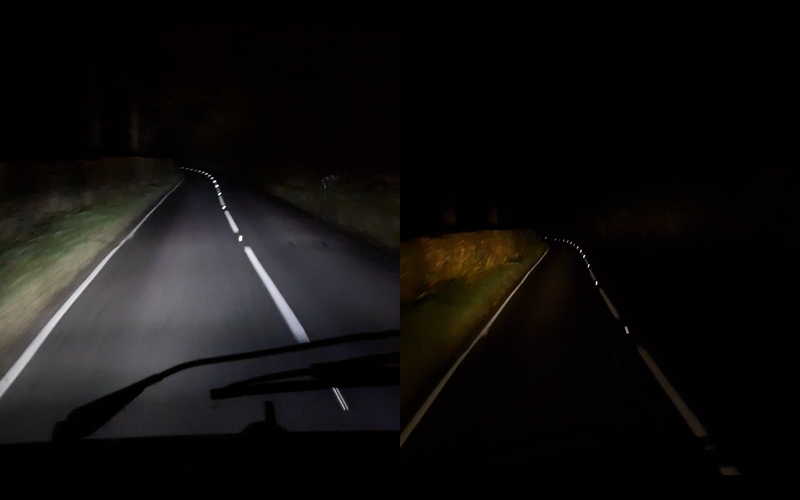 The round factory headlights are bad enough but we found the square ones even worse and night time driving with no street lights is just ridiculous. When you have to slow down because you cant see at night that’s when we decided to do smoothing about this. 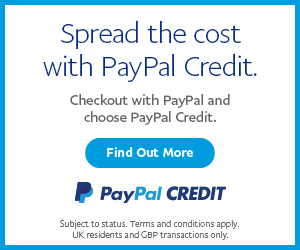 Development – We work very closely with an electronics company. They have all ready made loads of things for us to our requirements and the quality is aways spot on. Of course there are always development glitches before you hit the final product and that is why we like to test things thoroughly before we sell them. Testing – This kit for example has been fitted to the CVC Westy for the last 6 months and to two other vans for just under that. One has just driven all the way down to the southern tip of Portugal and back so we are now happy with the quality and durability. Fitting – Fitting couldn’t be easier. Our kit involves no wiring what so ever, if you can drill a hole and change a light bulb then you can fit our kit in no time. A link on a helpful info sheet will direct you to a step by step fitting guide is included with every headlight upgrade kit sold. You are required to drill just one small hole in the Hella headlight holder at the back that does not effect it’s operation on the unlikely event you decide to swap back to factory bulbs. Factory VW Hella square and round headlights require this on UK and European vans but the aftermarket round headlights we have seen do not require any hole. On square headlight vans the inner spot light bulb holder at the back requires a small amount of filing and again this does not effect the operation of the Hella bulb holder in the unlikely chance you want to go back to standard factory bulbs. All connectors on our upgrade kit use the same size connectors as the factory ones fitted to UK and European spec VW T25/T3 vans. CampervanCulture.com VW T25, T3 & Vanagon Headlight Upgrade Kit from CampervanCulture.com on Vimeo. Options – We do both square headlight and round headlight conversion kits. The main headlight parts are the same but the square headlight kits include parts to do the inner spot lights too so are a little more expensive. The lower grill day time running light pods can be purchase on their own and as extras in the drop down option box in the shopping options. For full fitting video tutorial please enter the fitting code that you will find inside of your kit here. This entry was posted in campervanculture.com, Product Review on January 9, 2016 by jed@CampervanCulture.